WorldFriends, a social network with a focus on connecting internationally-minded people, was established as early as 2003 but has flown under the radar of the American blogosphere since then. The Tokyo- and Shanghai-based site, which now has nearly 2 million users from all over the world, did a soft (re)launch last week, mainly enhancing a number of networking features. WorldFriends is walking a fine line between being a platform for dating, language exchange and making international friends. 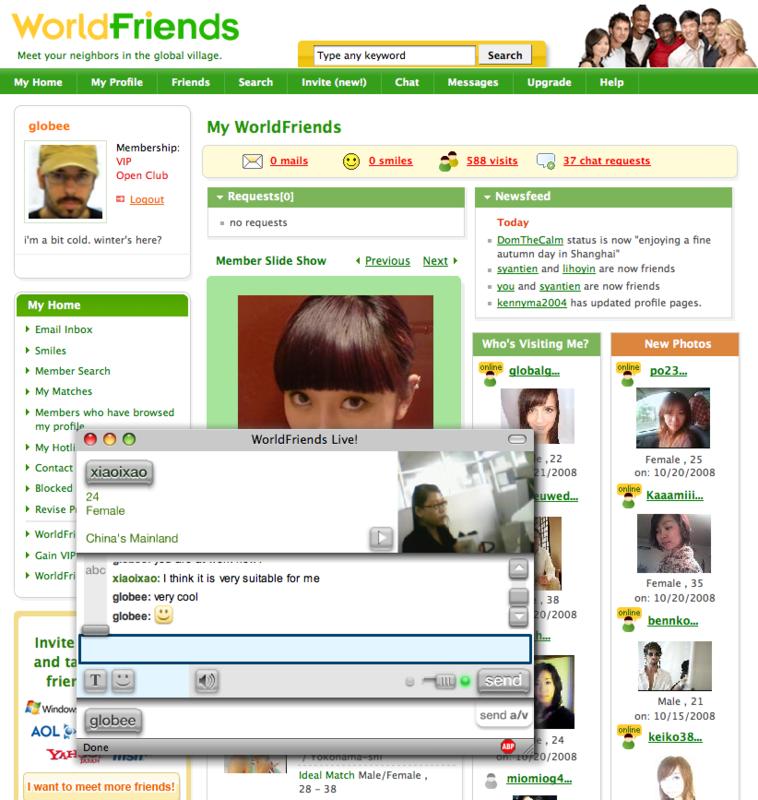 At first sight, WorldFriends actually looks much like a heavily internationalized version of your average dating site. The profile page, for example, features a member slide show (showing only female users if that is what you said you are interested in when signing up), a “New photos”-container (again girls only) and an “Your Ideal Match”-list. But WorldFriends CEO Dominic Penaloza says the focus lies on cross-cultural networking, finding international penpals, getting travel tips and learning foreign languages (yeah, right). The site, which is available in English, Japanese, Korean and Chinese, boasts over 110,000 language teachers among its registered members. About 65% of total message traffic between members is cross-border. Perhaps WorldFriends’ most interesting aspect is the business model, which isn’t solely based upon selling advertising space. The site charges users via three different kinds of upgrades that essentially enables members to interact with each other in various modes. For example, users have to pay $24.95 per month to be able to initiate contact (emails, instant messages, voice chat or video chat) to all members (initiating contact with friends and friends of friends is free of charge). It costs $244.95 a year to be able to initiate contact with all members and enable all members to initiate contact with you free of charge. By way of comparison, business network LinkedIn charges $199.95 a year for its so-called Business and $500 for its Business Plus premium accounts. Premium members of Germany’s business platform Xing have to pay about $90 annually. Penaloza says about 4% of WorldFriends members are paying for services, which certainly helped the site to reach profitability 3 years after launch. Currently the company is particularly active in Japan, where 33% of paid members are from. Penaloza says his price system is fair, particularly considering the $25 to $80 people in this country have to pay for a 60-minute English lesson. Consequently WorldFriends runs an office in Tokyo, which in July, almost unnoticed by Asian media, managed to close a significant partnership deal: Yahoo Japan agreed to become the first partner worldwide to adopt the new WorldFriends API (the site already has secured partnerships with over 200 websites, mostly through white label partnerships). Registered users of Nippon’s biggest web company can log into WorldFriends via their Yahoo Japan IDs and subscribe by using the Yahoo Japan Wallet payment service.